Three yellow-clad Mafia members watch one of the 25 opening round tables. Saturday must be yellow in the Mafia dress code! 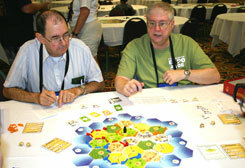 Breakout Normandy GM Ken Nied (right) betrays his Euro roots on his way to the Settlers Final. 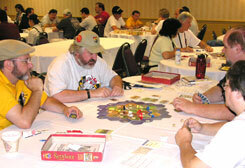 John Emery (left) and Roy Gibson (center) are in danger of losing their "wargamer" status. The fifth anniversary of the KOSMOS tournament format for Die Siedler von Catan saw 102 settlers join us for the annual trek to Lancaster. There seemed to be a reduction in the number of day badges in the tournament. This would indicate that most of our settlers are involved in all that the WBC has to offer. The tournament format has players settling during three games. Each of those matches earns Tournament points. Points are awarded based on placing 1st, 2nd, 3rd, or 4th. The 16 highest scoring settlers, at the end of three rounds, advance to the semi-finals. We finished another year without adjudicating any games. In five years, and over 500 games, only one game has ever reached the 90 minute limit and had to be adjudicated. For those unable to commit the time to play three qualifying games, we continue to accept drop-ins and drop-outs. My thanks to those who notified me prior to dropping. To those who dropped without saying anything, it would be a great favor for those playing in subsequent heats (as well as for your friendly neighborhood GM) to notify me or either Assistant before leaving. It makes the subsequent tables easier to seat. After nearly 75 games played in three heats, the number crunching for the top 16 began. For the past five years, a total of at least 11.X tournament points were needed to advance. This year was an exception as we had a player with just under 11 points make it into the semi-finals on the tie breaker. (Total VP scored, followed by a percentage of the points scored at the table). For the second year in a row, we had to ressort to the third level of tie-breaking procedures. Our 16 semi-finalists saw a few familiar faces (hello, Barrington!) in the penultimate round. After all the building permits had been issued, the four victors were identified as the Final Four. The same rules for the earlier games were used (time limit and initial placement round) to determine the 5th and 6th place laurelists. We had three settlers tied for 6th place and Mr. Bob (Elchfest) Runnicles standing alone for 5th place. The Final match of the day began on time after a short break. The game started with plenty of wheat spaces with good numbers, however, very little wheat ended up being sown. Significantly, the three brick tiles were covered by the 3, 3, & 2 discs. Roads and settlements were going to be difficult to build! Roy Gibson, the lone former laurelist at the table, jumped ahead to an early lead with three cities and the two points for the strongest Knight faction. With two of those cities sitting on the 3 brick, it was game over when he rolled a 3, allowing him to build the longest road, as well. After a full day of four previous matches, the Final was over, from sit down, meet and greet, lay out the board, place initial settlements, to game over in 35 minutes! Congratulations to everyone for making this years tournament a success and to our Finalists: Roy Gibson, Ken Nied, Jed Shambeda, and Rick Dutton. 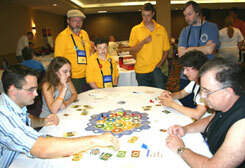 22 little Settlers contested the WBC Settlers of Catan Juniors title. The best of these proved to be Jennifer Sutton followed by Megan McCorry and Rebecca Melton who tied for second.